pakistan Is Osama Bin Laden Really Dead? On Monday American President Barack Obama announced in a speech that US has killed America's most wanted person and leader of Al Qaeda Osama Bin Laden in a operation in Pakistani city Abbottabad. 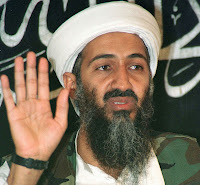 After few hours of this operation US Government announced that Osama Bin Laden's dead body is thrown in Sea. No photos or Video Footage of Osama's dead body is released so far by US Government. Well if Osama Bin Laden was really present in Abbottabad and was killed in a US operation then who will answer the following questions? Why dead body of Osama Bin Laden was thrown in water within few hours of his death? Why No Photos or Video of Osama's dead body is released so far while over 48 hours of his death are completed. Why Some Fake Photos of Osama's dead body where issued? Well all these Questions are creating suspensions in many minds and they must be answered.